Seeds of several agriculturally important legumes are rich sources of the only halogenated plant hormone, 4-chloroindole-3- acetic acid. However, the biosynthesis of this auxin is poorly understood. 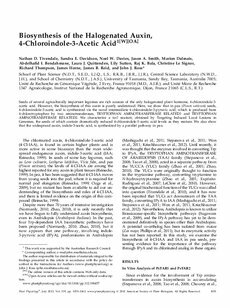 Here, we show that in pea (Pisum sativum) seeds, 4-chloroindole-3-acetic acid is synthesized via the novel intermediate 4-chloroindole-3-pyruvic acid, which is produced from 4-chlorotryptophan by two aminotransferases, TRYPTOPHAN AMINOTRANSFERASE RELATED1 and TRYPTOPHAN AMINOTRANSFERASE RELATED2. We characterize a tar2 mutant, obtained by Targeting Induced Local Lesions in Genomes, the seeds of which contain dramatically reduced 4-chloroindole-3-acetic acid levels as they mature. We also show that the widespread auxin, indole-3-acetic acid, is synthesized by a parallel pathway in pea.